The Chinese Pueblan or China Poblana is the name that refers to two terms of Mexican Culture that have been related since the 17th century. Nowadays we use this term to describe a piece of clothing recognized as part of Mexican Folklore. The original story of the China Poblana according to Diego Carrillo -Marquis of Gélves and Viceroy of New Spain- is about a young Indian woman (from the India Subcontinent not an American Indian) named Mirra. Her family of noble origin escaped from the Turks and was captured by Portuguese sailors trading slaves. She was sent to Manila in the Philippines governed by the Spanish. The Viceroy of the New Spain (Mexico) requested the governor of Manila for good looking slaves to come work in the palace. When the ship disembarked in the port of Acapulco instead of delivering her to the Marquis, she was sold as a slave to a man from Puebla and his wife; Captain Miguel de Sosa and Mrs. Margarita de Chavez. Mirra was baptized and given the Christian name of Catarina de San Juan by her new owners and was treated as a member of the family more than a servant. She was best known as China Poblana whose reputation fluxed between positive and negative extremes. Her wardrobe was considered too provocative but she was also considered a symbol of Mexican feminity. 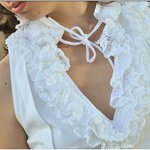 A white blouse, with fringing and embroidery work of silk and beads, in geometric and floral designs in bright colors. 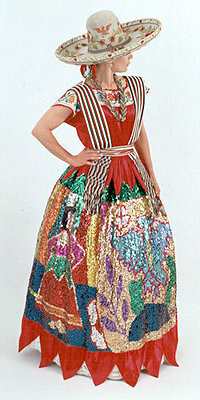 A skirt called castor, named after the material it was made from. It was decorated with sequins and shrimp that formed geometric and floral shapes. 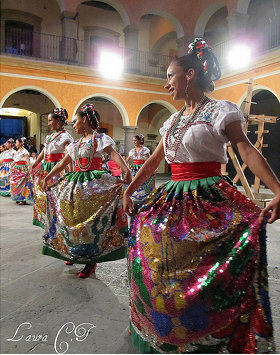 In folkloric dances groups have their own version that has the coat of arms of Mexico. A white slip with enchilada stitching and zigzag lacework. A loop that held up the castor and the slip to the waist. A shawl, made it with white silk. Satin shoes embroidered with silk thread. The china completed the outfit with beads and jewels that adorned her ears, her cleavage and her hands.